April 2, 2014 advertising, branding, product development, Uncategorizedhello toothpaste, new product introduction, oral care market, Procter and Gamble, promotionRandi Priluck, Ph.D.
Last week I was handed a full-sized container of toothpaste by an unfamiliar company. The brand Hello was distributing 6.25 ounce packages of pink grapefruit mint paste near Union Square in Manhattan. A full-size sample is a pretty expensive promotion and I thought that the situation was a bit strange. In general, whenever I receive samples I look up the company to make sure that the product is legitimate. This time I found out some very interesting information as well. 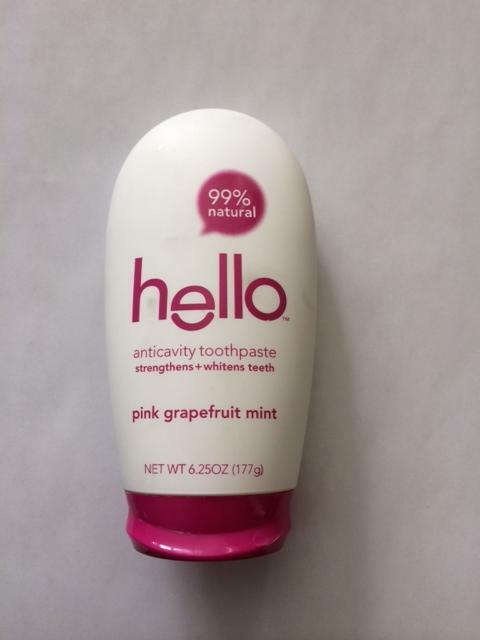 Hello is a new entrant in the US toothpaste market and is a 6 person operation based in NJ. The toothpaste’s package indicates that the product is an anti-cavity toothpaste that strengthens + whitens teeth. In addition the package reads “99% natural” in a pink bubble above the brand name. Therein lies the problem. According to Euromonitor the US oral care market grew +2% in 2012 to $6.9 billion. The major players including: P&G, Johnson and Johnson and Colgate control 64% of the market share with P&G leading the pack holding 33% of the total market. Though the market in the US is expected to grow 10% through 2017 oral care is a strange choice for a new brand given the entrenchment and strength of the competition. So it was no surprise when P&G decided to sue Hello over product claims. P&G filed suit in January to stop Hello from claiming that the product, containing ingredients such as sodium lauryl sulfate, was “natural.” In an agreement Hello agreed to stop selling their toothpaste with the 99% natural label and instead gave packages away for free. It’s one way to get attention for your brand. Now, will people switch?